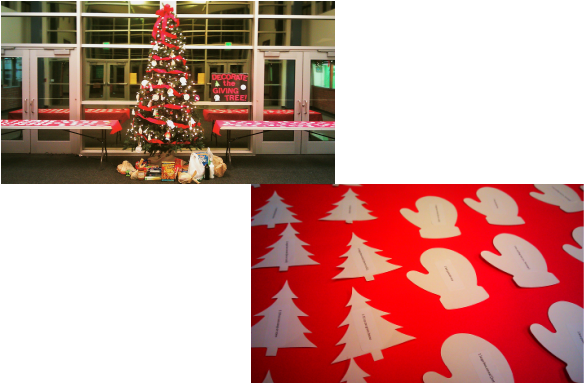 The 2013-2014 Giving Tree program is themed "Deck the Halls." Rather than creating the sign on my own, I asked a group of fifth grade girls to make our signs (didn't they do a great job?). They used butcher paper and die cut snowflakes were added. To see more photos, see the ASC Blog! In addition to the staff adoption of three families (see the post below for details), the entire school came together to collect food and hygiene products for families who might need the items over the winter break. As the tree filled up with ornaments, the school could clearly see just how generously we had shared with others! After two weeks, student leaders organized the donated food into 10-15 boxes using lists I had preprinted with foods and hygiene products to go into each box (see below). One evening, staff members came together to deliver the boxes to families in our community (I printed up maps to keep families confidential). 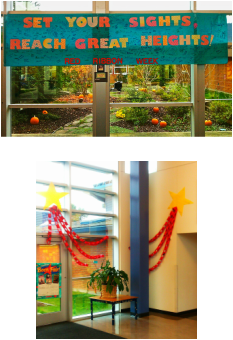 The theme of our Red Ribbon Week (October 22-26) was "Set your sights, reach great heights." Students focused on setting goals to encourage healthy choices, including eating well, exercising regularly, avoiding drugs and alcohol, and standing up to bullies. In the week prior, I set students up to discuss goals by reading the book, Wilma Unlimited: How Wilma Rudolph Became the World's Fastest Woman by Kathleen Krull and David Diaz. The next week, we used the "do my best" sheet in grades K-1, and the "have a goal" sheet in grades 2-5 (see attachments below; I will attach the Spanish versions soon). Once students chose a goal that was important to them, they wrote their goal on a red slip of paper to form chains. These chains formed the streams from stars representing each grade level (see photo above). On Red Ribbon Day (October 31st), students wore red to celebrate the culmination of Red Ribbon Week. The class wearing the most red won a pizza party! They also signed the banner as a pledge to strive toward their healthy goal. 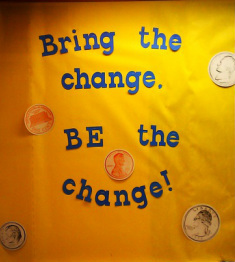 The display case in the lobby was filled with exemplary samples of student goal sheets. I have filed away the completed goal sheets and plan to revisit students' progress toward their goals at the end of the school year.